I just walked in the door from my first Chicago Jewish Blogger Dinner. Not just my first, but the first I know of. And since I organized it, I can safely say the first. The impetus for the dinner was to welcome a woman that I write with at PresenTense to Chicago. The editor emailed a few of us with Chicago connections and I thought it was a good excuse. We hammered out the needs (kosher) and preferences (vegetarian) and transportation (public) and settled on Tel Aviv Pizza up in Rogers Park. I wasn’t exactly sure who would show, but was thrilled with the turn-out. Therapy Doc and her husband came. Frumhouse and her husband surprised me. 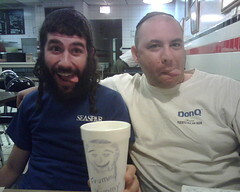 The Shalvster (and my roommate when I started this whole Jewish thing) was back from a month in Israel. Adam Davis of KFAR center and JewishFringe was there. Matthue from UnOrthodoxJew joined late. Dave (who, gasp, didn’t have a blog or a blogging spouse.) And of course, Deb, her husband and her cousin–our catalysts. The dinner really showed me how diverse my Jewish life is. Only because of blogging, do I know any Orthodox or traditional Jews. (Other than Pinny, but we met through Word of Mouth Marketing which takes the form of blogging for him. So really, he’s a blogging friend.) I also have my staunch secular friends and friends in stages of discovery about Judaism. I think knowing these bloggers keeps me from painting all those more traditional than me with a broad stroke. I can only hope that act as a good example of the Reform movement for them. It wasn’t about movements though and I’ve made it sound like we sat down to compare levels of observance. We talked about trying to find the rest of the Chicago Jewish Bloggers and why people blog, anonymity in blogging, lifestage support through blogging and how to increase our audiences. After all, we’re bloggers and we want more readers. It was fun to make connections. “Oh, that’s your gig? I’ve heard of that!” Realizing what a small world it really is. We had great amounts of fun and will definitely have more Jewish Blogger dinners. This was a first and definitely not the final.